I got the opportunity to use the custom whitening kit from Smile Brilliant and I have to say I am impressed. To be honest I was a little nervous to try it. One because my teeth are not all that straight and I was worried the whiting gel wouldn’t be even on my teeth. Two, every time I’ve ever tried to whiten my teeth, which has only been with either the strips or the mouthwash, I got shooting pains up my teeth and gums (mostly from the strips). I have really sensitive teeth. I can’t bite into ice cream and I prefer cool or room temperature water to ice water because I can’t handle the cold. I was determined to try it though, I am a coffee drinker and we all know how great that is on your teeth. With Smile Brilliant I ended up being pleasantly surprised on both of my concerns. I received my kit in the mail and was a little intimidated by it! The kit comes with the material (two part) to make your custom tray fittings, the holders, the whitening gel and desensitizing gel, and I was just thinking what do I do?! Before I completely worried I read the directions, which were simple and made me feel better. First step before anything was molding my teeth so I could mail in my impressions to get my custom trays. You have to make a top and a bottom impression (obviously) but you get three containers of the impression material. I understood why after my first impression came out wrong. There is a blue and a white material. You have to mix them together within one minute until you see no more white. I was frantically mixing until I realized how easily they mix. Then you roll it “hotdog style” and lay it in the tray. You put the tray in your mouth and bite down being careful not to scrape the front, not to bite down too hard but also making sure you bite down enough. The mold and tray stays in for three minutes, yes you will drool! I did my top first and when I got it out I noticed I bit too hard in the front because my front tooth broke through the mold and there was a hole in it. I did the bottom next and those came out perfect, then I used the third and last set of material and redid my top. Thank you Smile Brilliant for thinking about people like me who sometimes need a second chance because they overthink. Molds were complete! Next step was to send them in the prepaid envelope to Smile Brilliant so they could make my custom trays. The turnaround on the trays wasn’t long at all. I got a notification that my impressions were received and not long after, maybe a week give or take, my trays arrived in the mail. Now I was ready to try it out. I read the directions again to be sure. First you brush your teeth with just water, then put the whitening gel in the trays (1/4-1/3 of the syringe), dry your teeth and put them on. It was pretty simple and the trays were surprisingly comfortable. You can leave them on for 45 minutes up to 3 hours. I started off with 45 minutes as 3 hours seemed a bit ambitious for my first time. After your timer goes off you take off the trays, rinse them well with cold water, then brush your teeth with toothpaste. After that you dry your trays, then put the desensitizing gel in, dry your teeth, and do it again. This part is only 15-20 minutes. The desensitizing gel is to help with tooth sensitivity and help prevent re-staining. It was recommended to do this whole process at night that way after you finish the desensitizing gel you can just go to bed. When you take the trays out that time you just rinse them and leave your teeth alone, no need to brush. You also don’t drink anything after. That was it, so simple! I noticed a slight difference even after my first round! I started whitening every other day, or I attempted every other day, there were a few longer gaps, as my teeth probably couldn’t handle every day. Towards the end my teeth were getting a little more sensitive but still bearable. I was actually able to up my whitening time to an hour! So proud. Now I have whitened I think 10 times and I am so happy with the results! I smile in the mirror a lot to see the difference. I have even gotten a few compliments that my teeth were white. That has totally helped with my confidence as I have always been self conscious about my teeth because they are not straight. I am happy to say though that in the next month or two I am getting braces and you can bet when I get them off I will be using Smile Brilliant again! I totally recommend them. Once you have your trays you can always buy refills of the gel later so this is a system you can keep and use for a long time. I love that I will be able to keep it for when special events are coming up or just to maintain a white smile. I am smiling bright now! GIVEAWAY!! —> Click the link to enter to win a whitening kit of your own from Smile Brilliant! 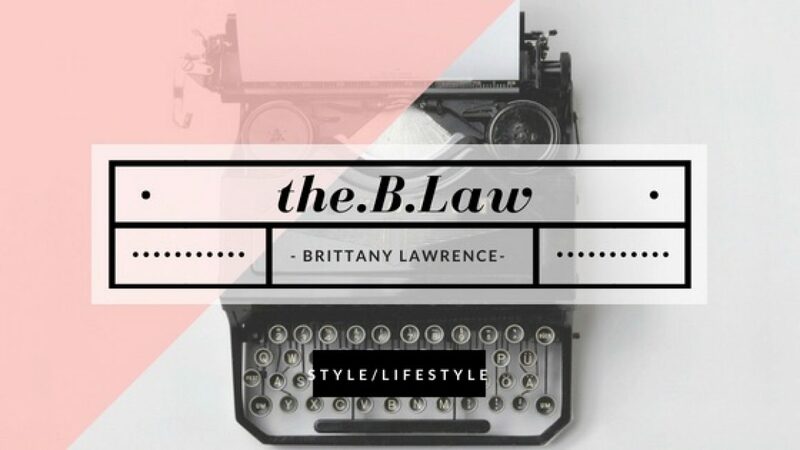 www.smilebrilliant.com/g/theblaw or use my code theblaw15 for 15% off your order! omg your before and after pic is amazing!